This entry was posted on Sunday, January 20th, 2019 at 7:50 pm	and is filed under Uncategorized. You can follow any responses to this entry through the RSS 2.0 feed. You can leave a response, or trackback from your own site. 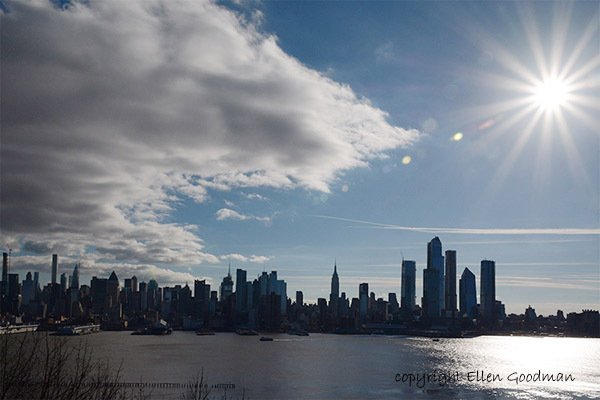 Perfect crisp New York skyline photo, Ellen! love the skyline but especially that multi-pointed sun. Well done again! What a spectacular photo. I love the supernatural effect of the sun. There is something inspirational about this photograph for me, more than just the image. On this MLK day, and day of continuing political turmoil, it feels as though the sun is banishing the shadow of clouds. Perhaps there is hope after all. Wow! I love the proportions of this photo–and I’ve never seen the sun look like this in any other photo. You have an amazing eye! WOW! Ellen, this is such a gorgeous photo! I don’t know what I like best: the perfect silhouetted skyline, the burst of rays from the sun (and their reflection in the water), or the angle of clouds next to the sun almost framing the city. Another instant classic. Well done! It looks like the rays of the sun are pushing away the clouds. This is such a dramatic photo: the dark silhouettes of the upright buildings contrasted with the rippling water, billowing clouds and the royal sun. Gorgeous! I love this photo! Magnificent shot of the Skyline, and the sky!! Great geometric forms in a totally realistic skyline photo. Beautiful composition of the water, sky, clouds, (what appears to be) setting sun and skyline. Magnicicent shot. The contrast and textures and oh, the sun! What a shot.